Tucked in between the majestic mountains of Western Ghats on the east and mighty Arabian Sea on the West, there is a beautiful small town called Udupi. There are not many places like Udupi that has rich history, colourful diversity, vibrant people, virgin beaches, incredibly charming buildings and simply irresistible cuisine. I remember visiting the Krishna Temple with my parents and grandmother once in every six months when we were small and a walk on a Ratha Maarga (Chariot Street) was one of my favourite parts of the trip. Dad would take us to small shops on Ratha Maarga looking for any unusual piece of art and craft for his antique collection and promise us to take to our favourite hotel on a way back home for sinfully delicious, crisp Masala Dosa. A lazy stroll along the streets of Ashta Matha (8 temples) with Ajji while she narrated an amazing story of Saint Kanakadasa and Lord Krishna is something I will always cherish. It’s been quite some years since I visited the temple but the memories are as fresh as morning dew on rose petal. Another part of our trip to Udupi that is one of my wonderful childhood memories is the food served at Udupi, be it at Krishna Temple or at my favourite restaurants Diana and Kidiyoor. For a foodie like me Udupi is food paradise. Even simple every day food has magical feel to it. According to history, the Udupi Cuisine has its origin in Ashta Matha’s of Udupi founded by the Vaishnavite saint Shri Madhvacharya in the 13th century. Locally grown grains, beans, vegetables and fruits are the hallmark of this divine cuisine. The world famous Krishna Matha/Temple is believed to be the centre of Dasa Saahitya, a form of literature originated in Udupi. And this same temple serves free food, called as Annadana, for thousands of devotees every single day. The temple food is simple with no frills. Rice, one or two Palyas (vegetable stir Fries), Rasam (thin, spicy Tomato Soup), Papad/Happala, Sambar (South Indian vegetable curry), Majjige Neeru (Spiced Butter Milk) and Payasam (Indian pudding) to finish this divine meal. This is one meal that not only satisfies your stomach but also touches your soul. One such recipe is Udupi Sambar usually made with no onion and garlic at Krishna Temple. The following recipe uses small pink Sambar/Pearl Onions. The vegetables used here Brinjal and Drumsticks are made for each other. The tang of tamarind and tomatoes, sweetness of jaggery and coconut and heat from roasted spices complements each other in this coconut-lentil medley. Back at my native we use Udupi Gulla Badane which has got big seeds compared to usual purple eggplants we get here. Nevertheless, you can use any vegetables of your choice like gourds or pumpkins as it is on slight sweet notes. The ingredient list might scare you but trust me when I say it’s really simple to make. Serve it with lacy and crisp Dosas or fluffy and soft Idlis or just plain steaming bowl of white Rice and Ghee to enjoy this divine food straight from Temple Town, Udupi. Heat 1 tbsp of Coconut Oil in a pan and add sambar/pearl onions, hing and few curry leaves. Sauté it on medium flame for about 2-3 minutes till they turn glossy and translucent. Add vegetables of your choice with cubed tomatoes and just enough water to cook the vegetables. Mix in turmeric powder, jaggery, tamarind puree/paste and salt to taste. Cover and cook for 10-15 minutes till the vegetables are cooked well. While vegetables are cooking, heat the pan and dry roast all the ingredients listed from Urad Dal to Dry Red Chillies for about a minute. Mix in grated Coconut and roast it along the spices for another minute or so till it turns light golden and aromatic. Cool and grind these roasted spices and coconut to a smooth paste by adding very little water at time. Add this ground mixture and mashed toor dal to cooked vegetables and mix well. Adjust the seasoning and add water depending on the required consistency of Sambar. Make sure that the sambar is not too thick or thin. Simmer and bring the whole sambar to gentle boil (takes about 5-7 minutes). Heat oil in a pan and add mustard seeds, dry red chilli, hing and curry leaves in that order. Transfer the tempering to Sambar when mustard starts to pop and splutter. Mix in finely chopped coriander leaves and let it sit covered for about 10 mins for all the flavours to blend well. 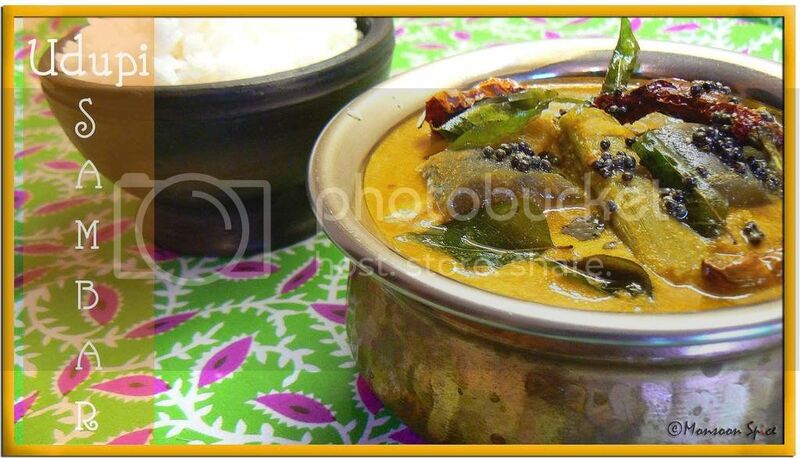 Serve this delicious Udupi Sambar with Idli, Dosas or plain steamed Rice and enjoy. 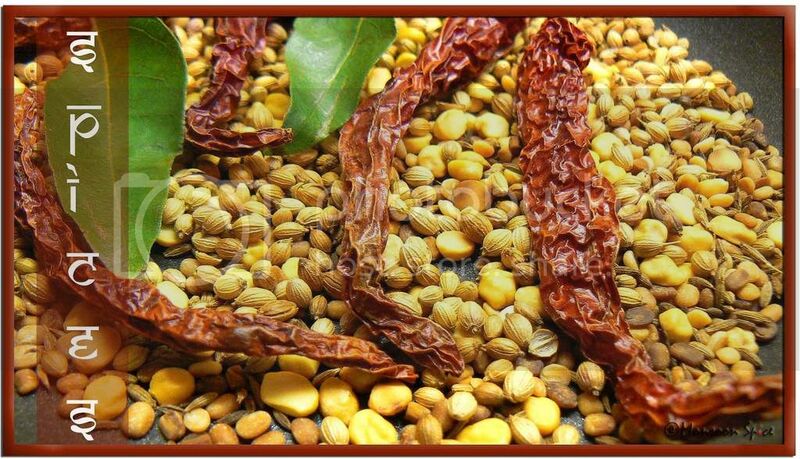 Prepare Udupi Sambar Masala (minus Coconut from the list) in bulk quantity and store it in an air tight jar for months. When needed dry roast coconut for a minute and grind to smooth paste with this Masala. You can make Udupi Sambar with just onions by replacing other vegetables. Make sure that you don’t boil the sambar for too long once ground coconut paste and cooked lentils are added. And also note that the sambar should not be very watery or thick while serving. WOW!.... YUMMY Sambar. Looks so good Sia. Love the presentation. Mouthwatering recipe. Really want to give it a try. Sia this looks delicious, I make same similarly except I use store brought or mom made masala. Sambar ..any kind is devoured by me..
Hey sia nice one this is my all time fav..
That looks yummy ! why don't you plan to move to USA somewhere exactly around NYC :D.
love udipi sambar, have to definitely try ur version :) looks excellent! BTW, did u get to try the raungi subzi over the wknd? 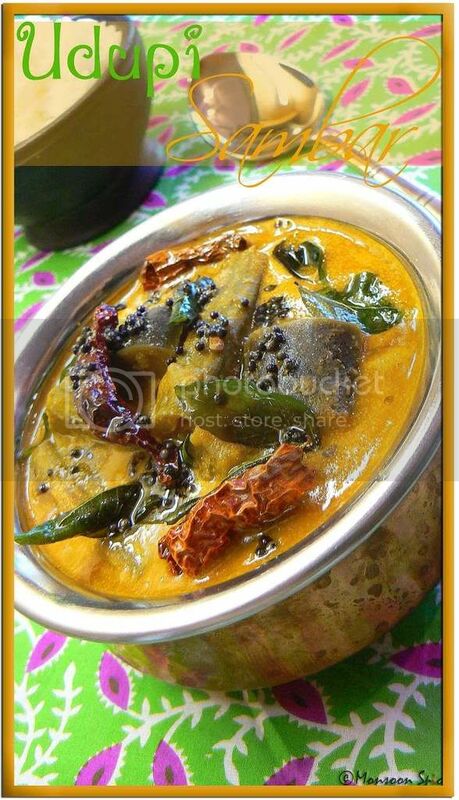 Wow....Udipi sambhar looks delicious. Your post made me nostalgic...going off to see some of my MAngalore pics. Beautiful recipe, Sups! Love it, love it, love it! Visiting udupi and Brindavan are two things I want to do before I die. Beautiful memories Sups. 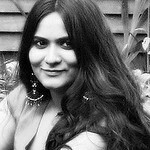 I have been to udupi many eons back when i was a little girl. Recently i had the good fortune of the Puttige Matha swamiji visit out home and perform the Krishna Dolotsava pooja at home. The head chef who accompanies the swamiji cooked a wonderful hot and delicious meal for 60 people in a matter of 3 hours! Words cannot express the taste of that wonderful food! Krishna Prsadam is like that! Love the look of your sambar, will surely give u're recipe a try sometime! I learn so much from visiting your blog. I long for some drumsticks. I haven't eaten breakfast yet and this made my mouth water! I've been to Udupi once, when I was little. I don't rememebr the food (unfortunately!). The sambar looks delicious! Wow.. I have an Udupi restaurant nearby and love their food!! When I moved to Chennai from Mumbai, I stopped eating idlis outside because the sambar wasnt Udipi sambar!! Just got back from my annual Bombay visit and slurped down bowls of it. Of course your version would be much much better than any restaurant! Thanks so much for the recipe and the travelogue! Recipe looks yummy...For sure will try out his weeknd..
excellent. thanks a lot, i tried it and came out very well. You have done a wonderful job bringing us nostalgia and great Karnataka cooking. I really appreciate your good work. I just got married recently and cooking is new to me. i tried Udupi Sambar and came out very well. I got appreciation from my in-laws and my hubby too. Whenever he wish he will ask me to cook Udupi Sambar.... I really appreciate your good work by providing this recipe. Tried this recipe yesterday for dinner and it turned out nice :).. Thank you for sharing the recipe. This recipe has now become a regular in my household, especially when family is visiting. Even my ajji, who is a strong critic of my food, loves this when ever I make it! Thanks for your wonderful recipes! I love this recipe, and make it every time my family visits. Even my ajji, who is a strong critic of my food, loves this when ever I make it! Thank you for all your wonderful recipes! @Jayanti Rao, it is so wonderful to know that even your Ajji loved it :) Thank you for letting me know. I really appreciate it. Your Udupi Sambar looks soooooo delicious! My mom uses fennel seeds instead of cumin. That gives a nice flavour to the sambhar powder.